This August, for the second year running, the official Fringe programme included a section specifically for spoken word. The 67 shows included are certainly a little footloose with their definition of spoken word: spot on the mark with original shows from writers Alan Bissett, Luke Wright, Jem Rolls and Liz Lochhead but a book reading from Ben Fogle, a conversation with George Galloway and an hour listening to the witterings of plummy-voiced cricket commentating legends Blofeld & Baxter? The past two years have seen an explosion in this oft suspiciously regarded artform, but it's nothing new. Performer. Audience. Words put together in an order designed, first and foremost, to be heard rather than read. It's one of the most ancient forms of performance there is. The modern history of spoken word (or performance poetry) is a well-rehearsed one. In the 1950s, the Beats clicking their fingers over coffee cups in Greenwich village hangouts to the seismic shock of Allen Ginsberg reading 'Howl' at the Six Gallery, San Francisco; in the 1980s, the self-conscious, grassroots rebellion of poetry slams in Chicago bars while spiky punk UK poets such as John Cooper Clarke and Porky the Poet (now perhaps better known as loveable TV sort Phill Jupitus) were wilfully blurring boundaries between stand-up comedy, protest and poetry in the UK. We could skip over the excesses of Murray Lachlan Young signing a £1m deal with EMI in the mid 1990s, and turn to Russell Simmons and Mos Def bringing Def Jam Poetry to HBO in the early 2000s. And to now, when poets like Lemn Sissay, Scroobius Pip and Kate Tempest are top billing at venues like the Southbank Centre, Glastonbury and the Royal Court Theatre. Of course, it goes back way beyond that. The Iliad and Odyssey existed as oral performances passed on over centuries before someone we now know as Homer thought to write them down. In Scotland and Ireland, the filidhean and the makars were elite performance poets, honoured guests of the Chiefs and the clans. Even slams are nothing new. The Scottish tradition of flyting dates from the 15th century, in which two makars would combat in a poetic joust, a furious contest of verbal abuse which combined extraordinary verbal dexterity with the most vulgar of insults. The most famous of these, the 16th century flyting between William Dunbar and Walter Kennedy in front of the Court of James IV of Scotland brought eye-watering new insults to the language. They would have run rings round George Galloway. This two-pronged attack of spoken word is as evident in Scotland as in the rest of the UK. The past few years have seen an explosion of regular spoken word open mic nights, particularly in Edinburgh with the likes of night such as Inky Fingers, Blind Poetics, Soapbox, TenRed, Poets at the Persevere and Musselburgh Hotpot, while One Night in Rio and the Verse Hearse fly the standard in Glasgow. At the same time, spoken word is now a major component of other mixed artform cabaret style nights: see Neu! Reekie!, Rally & Broad, Illicit Ink and Electric Tales in Edinburgh; Fail Better! in Glasgow; Demented Eloquence in Aberdeen. Event organisers are getting wise to the current vogue: in August, the Festival of Politics featured a slam in Holyrood itself; there were over 700 requests for tickets to the final of the 2013 BBC Slam; and Luminate, Scotland's 'creative ageing festival', is featuring a poetry slam as one of its key events for the second year running. I'm particularly proud of the vibrancy and diversity of the spoken word scene in Edinburgh. Being in the audience at one of the first Inky Fingers open mic nights in the Forest Cafe in the winter of 2010 was my particular spoken word epiphany: words on a stage, pure and direct and simple and funny and honest. Within weeks, I had become a member of the Inky Collective, organising events and workshops, and honing my own skills. The incredible value of so many regular open mic nights is that they offer the ultimate testing ground for new poems and new poets: you learn very quickly what works and doesn't work in front of a live (and usually sympathetic) audience. Two years later, Jenny Lindsay and I decided it was time for a new high-end cabaret in Scotland, bringing music, spoken word and other lyrical delights to new audiences. Thus, Rally & Broad was born. October sees the grand relaunch of our second season, in which we are thrilled to be bringing poets including Tim Turnbull, Ross Sutherland, Don Paterson and Hannah Silva to Edinburgh audiences. For those who are interested in this most direct, ancient and modern of artforms, it really is all around you. 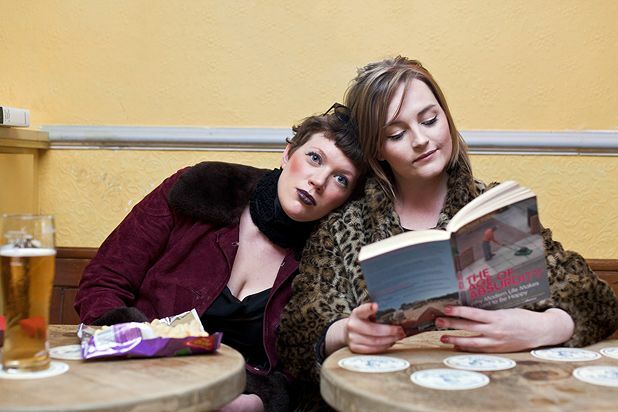 Rally & Broad, The Counting House, Edinburgh, Fri 18 Oct.
A blended mix of comedy and storytelling, making for a chilled night of funny yarns and verse told by a range of performers, with the sole aim of cheering you up. Open mic for literature and spoken word lovers. Email ahead for a chance to perform, or just watch and admire. A free monthly night of spoken word and poetry on the second Monday of every month. There are limited open mic slots available, email blindpoetics@gmail.com to express an interest. A slam poetry night presented by Inky Fingers and Age Scotland. Compered by Rally & Broad. Tickets available at the Traverse Theatre. Booking is essential. A literary-flavoured cabaret night, boasting spoken word, 'live literature', new music and dancing into the wee small hours. Hosted by Jenny Lindsay and Rachel McCrum. A night of words, song and film curated and presented by Fail Better. Illicit Ink keeps things dark and playful at this bimonthly, themed writers' performance night. Illicit Ink's narrative-focused spoken word event offers an unusual set-up: a crew of writers and performers work together to create an ensemble story with a complete narrative arc.